1. Peel mangos and cut each cheek away from the stone. 2. Cut the cheeks into large pieces, about 2 inches by 1 inch. 3. Heat ghee and saute red chillies. 4. Add saunf, fenugreek and onion seeds. 5. After a few seconds stir in mango pieces and stones. 6. Add turmeric and stir gently. 7. Meanwhile boil 2 cups of water. Add to cooking mangos and simmer till mangos are cooked through but not mushy. 8. Taste and add sugar. Note:- To cut down on ghee, use less, about a teaspoon, and sauté the spices. Mango tends to stick, so add boiling water first and then the pieces of mango. Simmer till the mango is cooked through. 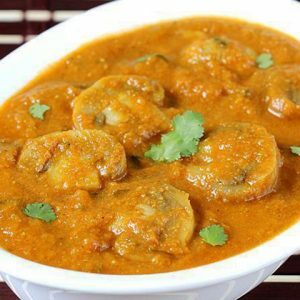 Feel free to comment or share your thoughts on this Ripe Mango Curry Recipe from Awesome Cuisine.